The other day, after briefly mentioning how Kroll’s second report is now a month overdue (with no information about when it will ever be released), I remembered that somewhere in my archives I had a copy of the original Kroll report from April 2015. It’s a rather long and “boring” document but it is written in English so I sat down and read it thoroughly. The scope of the report is an initial inquiry into what everyone in Moldova is calling jaful secolului or the “Theft of the Century”, in which approximately $1 billion was siphoned out of three Moldovan banks, usually estimated to me roughly 1/8th of the country’s GDP. It’s pretty clear that the man primarily responsible for the theft is Ilan Shor, whose life story even beyond the banking sector is quite unusual. His family, self-identified as Jewish, emigrated from Moldova (then the Soviet Union) to Israel in the 1970s. It’s never mentioned how this happened but I remember those days well, and there’s a Wikipedia article on the topic in case you’re interested. The Shor family then decided, for reasons unknown, to return to Moldova in 1990 right around the time that the Soviet Union was collapsing and RM was becoming independent. Ilan Shor was born in 1987 so spent most of his life growing up in Moldova, where he apparently inherited his father’s “business” acumen. By the year 2008 (when Shor was just 21), he was in a club in Chisinau where he somehow ran into and befriended a rising politician named Vlad Filat (then 39 at the time) who had just founded a new political party named PLDM (Liberal Democratic Party of Moldova). Shor was already quite rich at this time thanks to a combination of his own hyper-aggressive entrepreneurial spirit and guidance from his financially savvy father (who died in 2005). From there, the two men (Ilan Shor and Vlad Filat) became colleagues on some level. Thanks to a series of political gaffes by the then-ruling semi-dictator, Vladimir Voronin, head of the Communist Party, elections were held in 2009 and a coalition of “pro-EU” parties, including the PLDM, came to power. Vlad Filat then became the prime minister in late 2009. After his rise to power, Filat benefited from a number of “gifts”, including huge sums of cash, from Shor when Filat helped quash some investigations into Shor’s companies. Filat ultimately was thrown out of office (and then arrested) partly thanks to a wiretapped conversation in which he was demanding a cool $1 million from Shor in exchange for his (Filat’s) passing government business to a number of Shor’s companies. In 2011, Shor married an extremely popular Russian singer known as “Jasmine” in what was basically the celebrity wedding event of Moldova. Aside from the strange fact that the ceremony was held at the old parliament building (symbolically attended by all of Moldova’s “pro-EU” political leaders), the bride herself was celebrating her second marriage. She’s also more than 20 years older than her husband and already has a kid from her first marriage. 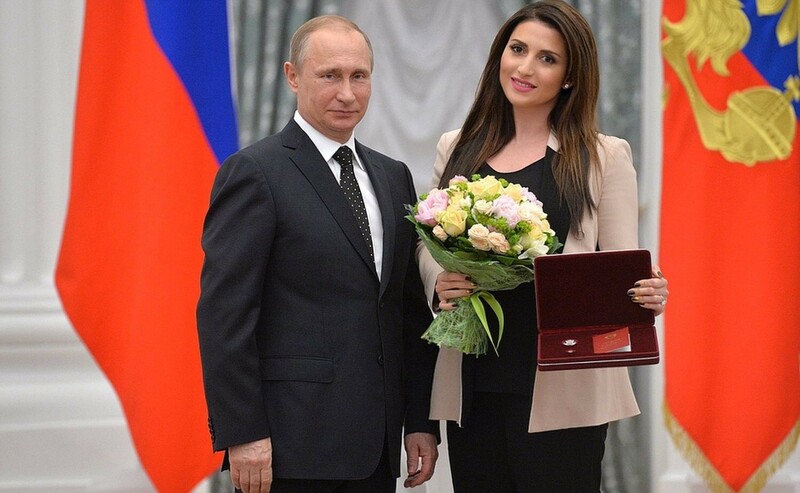 Despite the fact that she’s still married to Shor, there are no photographs of her and her husband on her official site, but there is this one of her getting an award (along with what looks like her Russian passport?) from a bored Vladimir Putin. Whatever Filat’s guilt in all of this, he remains in jail and still maintains he is innocent. Shor, however, is now the duly-elected mayor of a tiny city in Moldova called Orhei, allowed to run for office when he was still under house arrest during the initial investigation into the Theft of the Century. Aside from a few critical articles in the press, Shor is seemingly in no danger of being prosecuted for anything and has not been re-questioned about the Theft of the Century in the past year. Nonetheless, the report from Kroll that I have in my possession is a doozy. After it was released (by A. Candu, the leader of the pro-EU bloc that is protesting the current Moldovan government) to the media, the BBC managed to interview Ilan Shor. Despite the fact that Shor was the head of one of the three banks involved in the Theft of the Century, he denies all knowledge or participation in the theft. That’s a little bit like Nixon saying he knew nothing about the Watergate burglary, which is interesting because Nixon almost did get away with lying about his involvement and only a series of fortunate coincidences (involving someone giving routine boring testimony mentioning that Nixon audio recorded his own office (which WTF? nobody has ever quite explained why he did that)) led to the truth coming out. Make no mistake, the Kroll report is devastating and is far more than a “collection of press clippings” (Shor’s response) and shows hard numbers and facts that overwhelmingly demonstrate that Shor and/or other individuals working with him benefited from this $1 billion theft. In case you’re interested in stealing a billion or two, I’m going to explain exactly how Shor did it. The Kroll report is quite long and described by the BBC as “bafflingly complex” but if you know what you’re doing, it’s not that difficult. The three banks involved in the scandal were Banca de Economii (BEM), Banca Sociala (BS) and Unibank (UB). A number of other Moldovan banks had collateral involvement, including Moldincombank (MIB) and Victoria Bank (VB). Out of those banks, what’s key to understand here is that BEM was majority-owned by the Moldovan government until 2013. It was a “regular” bank, in the sense that ordinary people had deposits and loans from the bank but also was kind of like the Romanian CEC in the sense that any time you had to pay an official government fee, it always went through BEM. Ok, let’s see how to steal a billion bucks! It looks like in the period of 2011-2012 that Shor and his companies took out a few ordinary, legitimate loans. It was obviously during this time that they identified a number of vulnerabilities and then moved to hatch their plan. UK limited partnerships, unlike limited companies, are not required to file publicly-available annual returns or accounts. The only public information they must supply is their registered address and the names of partners – but these need not be individuals, and need not be based in the UK. The number of limited partnerships registered in the UK has risen sharply, from 17,239 in 2009-2010, to 27,853 in the last financial year, 2013-14. These shell corporations then operated with money from a number of Latvian banks. Both the Latvian bank accounts and UK shell corporations were set up just a month or two before the theft began. Two things happened in 2013, which is that the original majority owners of BS and UB (one of which was a legitimate Austrian banking concern) somehow got convinced to sell all their shares to new owners. BEM, which up until then had been majority-owned by the Moldovan government, reduced its holdings to 33.3% (one third) and sold off new shares in order to bring in new money to the bank. For some bizarre reason, the National Bank of Moldova (the Central Bank) had different reporting rules for stakeholders of banks who held less than a 5% share than ones who held more than 5%. Knowing this, Shor orchestrated that a number of shell companies bought up all the available shares in all three banks making sure that none owned more than 5% (several owned 4.99%). This is where it gets fun. To buy up the bank shares, a number of fictitious companies were created in Britain. These companies then did two things – first they bought the available shares (to control the Moldovan banks) and then paid off the bank’s debts. All three banks had what’s known as “non-performing loans”, meaning that the original person or company who took the loan from the bank wasn’t paying it back. Instead of the normal practice of buying these debts at a fraction of the cost, the fictitious British shell companies paid off the loans in full for a loss of about $50 million. The next step is to get a close circle of friends in positions of power at the banks. Shor himself took control of BEM but a number of his buddies were also involved, including his stepmom (late father’s last wife). The purpose of paying off the old debts was to increase the bank’s liquidity, sort of like “balancing the books”. The banks now had less debt and so could lend more. And that’s just what they did. Kroll estimates that between 80 and 95% (depending on the bank) of new loans went to the network of Shor shell companies. As an additional way to increase liquidity at the three Moldovan banks, they began to move money around in a weird way. They would deposit a certain amount of money (X dollars) at a Russian bank which would then simultaneously deposit the same amount back (X dollars) on the same day in the Moldovan banks. The only problem with this is that some of the Russian deposits were just lies on a piece of paper. BEM, BS, and UB would tell the Moldovan National Bank that a Russian bank had deposited X dollars but failed to provide hard proof of this, so it’s suspected that some of these deposits never even occurred at all. Meanwhile X dollars from a Russian bank being held by a Moldovan bank allowed them to increase their liquidity and thus loan even MORE money to Shor-controlled shell companies. In order to pump up the banks’ ability to keep paying off loans, some of the fraudulent loans to Shor’s companies were actually repaid. The purpose of this was to make it look like the loans were legitimate. Bank makes Loan #1, then gets paid back with interest, showing that Loan #1 was “legitimate”. It can then make an even bigger Loan #2 to a “new” customer, which is actually yet another one of Shor’s shell companies. An additional step to laundering the loans was to have one bank (say BS) pay off a loan held by another bank (BEM, for instance), thus making it even harder to see that these loans were not legitimate. By November 2014, the heat was on and so Shor and his conspirators “recycled” the loans one more time, paying off the old ones in exchange for huge new ones. The total sum of the new loans was about $1 billion, a tidy sum by anyone’s standards. At this point, a new man was the acting director of BEM, a guy named Viorel Birca (Shor having wisely divested himself at this point). For “reasons unknown”, Birca ordered a ton of important paperwork about these loans to be transported to some “archive”. A car belonging to a company controlled by Shor’s mother-in-law, Klassika Force (still in business today) showed up and picked up these important documents. It then went and picked up some equally critical documents from UB. After that, the car disappeared. It was eventually reported stolen and found days later by the police having been completely torched. In a separate move, a ton of computers and other office equipment with hard drives was wiped at the three banks, destroying a lot of key evidence. At this point, the government stepped in and took over BEM, shutting it down and now on the hook for paying back every account that got wiped out by the Theft of the Century. But in a coordinated takedown, Vlad Plahotniuc, a bitter opponent of Vlad Filat, decided to make his move and used the wiretap of Filat blackmailing Shor to have Filat stripped of his immunity and then thrown in prison. Plahotniuc’s forces then took complete control of the government, excluding their former colleagues in the “pro-EU” bloc. Shor, meanwhile, got treated with kid gloves and was allowed to run for office, becoming mayor of Orhei where he is both popular and seemingly in no danger of any prosecution. Shor knows how to take care of himself and focused the anger on Filat while miraculously denying that he had any involvement in the Theft of the Century. His standard denial is that the bad loans occurred before his arrival on the scene despite the fact that the total loans outstanding by BEM before his involvement was roughly a third of what was stolen. Meanwhile Dorin Dragutanu, who had been the golden boy leading the Moldovan National Bank, clearly got caught with his pants down and resigned. The only problem is that nobody was ready to replace him and so he has stayed on the job for now (despite unknown people throwing grenades at him) and now Plahotniuc’s boys are being groomed to take over the job. Despite an almost pathological need by Romania (and its overlord, Victoria Nuland) to want to keep up propping Moldova, it now looks like the days of getting away with enormous frauds are coming to an end. Shor is comfortably “on the bench”, running his little fiefdom in Orhei, while a new crop of gangsters under Plahotniuc’s thumb are running the show in Chisinau. The problem though is that some very dedicated popular protests are showing no signs of dying down and just about every foreign creditor is refusing to keep funding the mafia organization that is the Moldovan government. Nobody currently in power wants to upset the apple cart because it’s obvious that there’s widespread corruption and fraud on a massive scale from all of the big players in Moldova, including every last “darling” that received so much praise from Romanian and American leaders. So far, the thugs in power have managed to cloud the issue by constantly promising to do whatever is necessary to join the European Union (and NATO) while issuing scary threats about a Russian takeover. But that facade is starting to wear thin, even to the long-gullible European Union and Romanian leadership. It’s only a matter of time before the money runs out and so does the patience of the ordinary people protesting on the streets every week. It’s impossible to guess what will happen next except that it’s going to happen soon. Romania, the US, and the EU will clearly start trying to find new partners amongst the “anti-Russian” wing of the bloc that’s currently protesting the ruling oligarchs, probably choosing to fund and support Maia Sandu as the new Great White Hope. Russia, meanwhile, despite constant press reports about dirty tricks, is in the pole position with almost no effort due to the sheer mass delusion that the “pro-EU” bloc was ever interested in anything other than large-scale robbery of the Moldovan people. Sooner or later, the Socialist Party led by Igor Dodon (and secretly led by Zinaida Greceanu) is going to be a major stakeholder in the new Moldovan government. They’re far too entrenched in Moldovan politics to truly be “clean” enough to implement real reforms but they have been excluded from power so long that they likely will put some important people in jail. And yes, while they do have strong positive ties to the Russian leadership, they’re strongly patriotic and liable to make some decisions that will anger Russia. And while Kroll has apparently been silenced (or, more likely, not paid) on the issue of the Theft of the Century, banking regulators in Latvia are now working overtime to start to put together the pieces of their end of the puzzle. So it’s anyone’s guess what new information will turn up in the months and years to come. The joker in the deck of cards though is Renato Usatii. The closest analogy I can come up with is that he’s the Donald Trump of Moldova (Romanian press calls him the “Gigi Becali” of Moldova). He’s a showman, a populist, and a guy who has enormous charisma. He’s also rich thanks to mysterious circumstances and he’s got deep, deep ties to Russia. Whether that means he’s a “puppet” of Russia or not is unknown at this point but this guy knows how to get votes and is enormously popular on a personal level. He and his personal political party (now called “Our Party” but it went through some name changes) were banned literally at the last minute from the 2014 parliamentary elections due to Filat/Plahotniuc’s men ruling that too much funding came from Russia. Again, nobody knows if that’s true but if anyone is going to make radical changes (one way or another) in Moldova, it’s Usatii. Right now, Usatii is the mayor of Balti and a pretty popular talk radio personality but it’s anyone’s guess what he will do once he becomes prime minister or president (both likely possibilities). One thing for sure though is he will seriously piss off Romania and the United States, as he is about the last guy on earth willing to be a toady for the west. But for now Pavel “Mr. Midnight” Filip and his 60-odd men in parliament are hanging onto power by their fingernails, doing their best to be as smart as Shor and bamboozle the IMF, World Bank, and EU with a lot of ginned up paperwork that promises reforms, including in the banking sector. But that nut is starting to crack and we’ll see what spills out when the whole charade comes to a screaming and possibly bloody end.